Back in 2004, before Gather, I started an event called The Rock & Shop Market as a place for local makers to sell their wares because there wasn’t anything like it out there for them (or me). It’s kind of hard to remember what that landscape looked like when these days it seems like there is a makers market everywhere you look. I hosted the event for ten years and through it met thousands of maker entrepreneurs aiming to grow their creative business. Sonya of Metamorphosis Metals was one of the original and consistent vendors at my juried markets, and in 2011 when tornadoes came through Raleigh and decimated homes in the Southeast Raleigh neighborhoods I commissioned her to make a custom necklace to raise funds for the Boys & Girl’s Club that was also affected in that neighborhood. 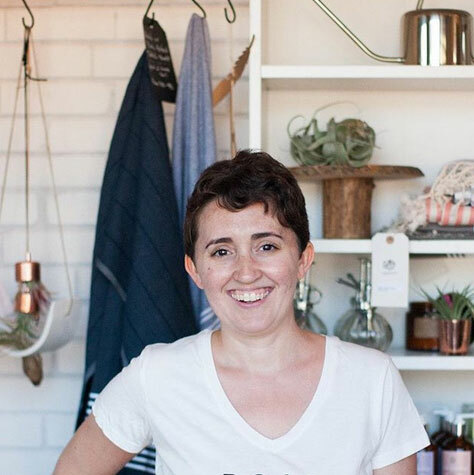 She has been steadily growing and refining her business over that time and it’s been cool to watch as the city around us has grown and changed and evolved itself. She’s teaching an upcoming earring making class at Gather in downtown Cary this Thursday April 11th at 6:30pm. It is sure to be a good time and you are going to learn a lot. Sonya has a distinctive metal style and she’s sharing that process in this class. You can register for the class here. Geometric metal jewelry is a trend that I don’t see going away any time soon. There is something earthy and beautiful about the juxtaposition of raw metal shaped into new forms. Make your own set of beautiful geometric stud earrings at Gather in downtown Cary on Thursday April 11th at 6:30pm with metalsmith Sonya of Metamorphosis Metals. In this hands-on workshop Sonya, a twenty year jewelry making veteran, will be teaching how to cut, shape, hammer and solder. Hope to see you there. You can register for the class here. Bullet Journaling is a specific method of journaling that has taken the creative world by storm in the past few years. Lucy Kagan will be teaching about it as part of our Creative Journaling class at Gather on Thursday night. You can register for the class here. Bullet Journaling as a concept was created by Ryder Carroll a designer who realized his particular method of documenting his projects was unique. Essentially bullet journaling is where you categorize your thinking into different lists and reference them by a table of contents but one of the main philisophical tenants of the method is that it is an analog way to document projects in a mostly digital world. It has been a method that has worked particularly well for me. In addition to lists you can add all sorts of interesting things and ideas that you want to track and catalog. The beauty of the system is that once you have a grasp on the basic framework (which takes some digging in and applying) it is really customizable and logical. It’s a great system if you like things both organized but also have an abundance of creative output. I especially love seeing how others use their own bullet journals and could search endlessly for how others are using them. Here is a page found on wellella that helps her stay on target with mental health and wellness by tracking her gratitudes each day. Here are some example lists from bujo.auslife on the bullet journaling site. Of course this method appeals to me so much that I even created my own analog “goal tracker” about ten years ago that I still sell here. It is a simplified version of goal tracking and was created before the bullet journal method was a thing. What I love about the bullet journal though is you can have all sorts of lists and you can be as colorful, neat or messy as you want, the interpretation is half the fun. Will I see you in Thursday night’s class? In addition to workshopping your own journal that we’ll provide you’ll learn three different creative methods: Bullet Journaling, Creative Journaling and Graphic Novel style Journaling. You can register for the class here. It seems only natural that given Lucy Kagan, instructor of Thursday night’s Creative Journaling class at Gather in downtown Cary (register here), would have a penchant for drawing fairies, plants and nymphs given her family home. Growing up with a long line of gardeners, her environment seems to have made a strong impression on her and I can see why. There is something about being surrounded by thousands of living things, then nurturing, cultivating, observing and documenting them that conjures a certain magic and applies itself to your life. Hellebore’s or Lenton Rose flowers shown here are one of the only flowers that bloom in winter and early spring. They prefer wooded/shaded spots and have colors ranging from purple to pale pinks and whites. They are perennials so they come back year after year and like many flowers look especially good in large clusters. A gravel patio area at the back of the home holds a charcoal grill and some seating for dining al fresco as well as extra firewood. A vine covered trellis leads to a greenhouse attached to the side of the house which holds plants in progress, pots and other gardening implements. Sticks from the yard have been collected over time and are being turned into a wattle fence which is done by weaving together branches into a basket pattern forming a natural and artistic edging and barrier. Beyond the fence is an enclosed compost area. A cold frame shown here keeps cool season plants such as lettuces and greens incubated and warm during cold nights. You can see more of Lucy and her parent’s home here and her work space here. You can register for Thursday night’s Creative Journaling class taught by Lucy at Gather here. Well, our annual springtime teaser looks like it is in full swing with tomorrow being chilly again. Here we are about to be in the sweatshirt weather again, which to be honest, is fine with me. It means cozy comfort food like this Tomato Florentine Soup. I love this soup with fresh sourdough -or if you’re not vegan, these Cheddar and Herb Biscuits. In a large stock pot, sauté onion, garlic, celery, and carrot in olive oil until onions are translucent and edges are starting to brown a bit. Add remaining ingredients, but reserve half of the spinach. Simmer for 2 hours on low. Remove bay leaf and purée with immersion blender to a texture of your liking. Alternatively, you can purée the soup in batches using a regular blender. Stir in the remaining spinach when you are ready to serve. Garnish with a lemon twist or parsley sprigs. As promised, here are photos from the wonderfully eclectic, art-and-portrait filled home of artist Lucy Kagan and her parents in Raleigh, North Carolina. Lucy is the instructor of the upcoming Journaling class at Gather on Thursday March 27th at 6:30pm. You can register for the the class here. When I was here taking photos, Lucy’s Dad, a landscape designer and violin instructor, was in his basement workshop making new wooden steps for an outdoor walking path. Her mom, also a landscape designer, was at work but her presence was felt in the lush native gardens surrounding the property and in block prints of hers dotting the walls of the home. This home previously belonged to Lucy’s Grandparents who, before living here, hailed from Massachusetts and spent part of the year there and the other half in the West Indies. The home is filled with portraits and paintings many of which were made by and feature family members. In addition, there are Meyer lemon trees and an abundance of well-loved houseplants and collected ephemera throughout the home. Next up I’ll show a few pictures from their yard. Though there aren’t a ton of blooms to show since spring is still emerging, I can only imagine how lush and inspiring their cultivated patch of land around their home is in just a month from now. Photos by Michelle Smith for Gather Goods Co.
Lucy Kagan, the instructor of the upcoming Creative Journaling class at Gather on Thursday March 28th, is a talented artist and illustrator who grew up in a family focused on art and design here in Raleigh, North Carolina. After going to an arts-centric magnet schools growing up, she then went to Savannah College of Art & Design (SCAD for all you art school nerds out there) and studied illustration & textile design. Following that she worked at both URBN and Martha Stewart where she designed products and repeat pattern designs before a wrist injury sent her back here to recover in the lush plant focused home of her parents – both landscape designers and artists themselves. Lucy is one of those quirky, jill-of-many-trades types that resonates as a kindred spirit with me. In addition to her specific illustrative style, a sweet and whimsical watercolor look rooted in fairies and plants, she has printed and distributed numerous small publications, and graphic novels and sewn (and hand dyed with plants) a line of apparel including the top she is wearing in these photos. In the Creative Journaling class that she is teaching she will be going over the processes of three different type of journaling styles and teaching you how to stay on track with making your own. The class will go into depth on three different styles: Bullet Journaling, Art Journaling & Autobiographical Comicbook Style Journaling. Students will walk away with a started journal and practice in each technique as well as productivity tips and tools. In a few months she’ll be teaching a specifically illustration based class at Gather as well so be on the lookout for that. I so enjoyed photographing Lucy at her home base and have more photos to share in the coming days as well. I’m looking forward to carving out some time to express myself through this upcoming journaling class. If you’d like to join us you can register for the class on Thursday March 28th at 6:30pm at Gather here. On Thursday March 28th at 6:30pm, professional illustrator and avid zine maker Lucy Kagan of Cottonbook will be teaching a Journaling Class at Gather in downtown Cary and going over the processes of three different type of journaling styles and teaching you how to stay on track with making your own. The class will go into depth on three different styles: Bullet Journaling, Art Journaling & Autobiographical Comicbook Style Journaling. If you’d like to join the class you can register here. I am really looking forward to going in-depth on this creative process with others and finding some techniques to help me stick-to a habit of doing it more seamlessly in one spot (vs millions of scattered journals). Journals are arguably one of the most treasured possessions of a creative mind. No matter the form, time has shown that most creatives use them in some capacity to flesh out their ideas, to express themselves, and to process the world around them. I’ve rounded up some inspiring art journals here from others. I have dozens of different types of journals but my favorite/most consistent form of personal self expression/discovery is collaging. I’m also a huge fan of bullet journaling which I will go into more depth on another day (and of course at the class on Thursday March 28th – will you be there? Sign up here). I’ve often remarked to my husband (any anyone else who wants to talk with me about some of my favorite subjects: plants, shops, branding and merchandising) that Terrain is my Disneyland. The shop which is part of the Urbn umbrella that also runs Anthropologie, Urban Outfitters and Free People has my number. Everything about the space is merchandised impeccably and branded in that subliminal organic, natural, high end way that sets if apart from a lot of other retail out there. The plants are also very well maintained. It is also, like any of the stores under the Urbn umbrella brands, very of the moment. It is aspirational and inspirational to mere mortals like myself who, with currently a team of one, do all the photographing, blogging, lease management, event coordination, upfitting, product purchasing, shipping, designing, email responding and so on and on and on (though a few years ago I did manage a team of 8 at Gather – even then something of this scale felt unfathomable). Regardless, it is inspiring to see what those teams of thousands do when they are focused exclusively on color ways, on finding the most perfect product, on creating custom display fixtures and so forth, into their space. We have family that lives near their nursery/store in Pennsylvania so we always take a detour to stop in every time we are in the vicinity. As with many things these pictures don’t really do it justice. It’s really about the in store experience and really needs to be walked in person to appreciate it in full. The outside grounds are like any other plant nursery and filled with trees, shrubs and other large plants and outdoor decor and seating. Inside is where the magic really happens. It is as you would expect from walking into any Anthropologie store only change the palette to muted greens, the subject matter to plants and related ephemera versus clothing. Here air plants are merchandised in front of a large display wall of moss. Though it is a fine line between this and say The Rainforest Cafe, somehow it works, and though very very heavy-handed, manages not to feel that way. An azalea topiary forced to bloom early. Their onsite cafe in a solarium style space. A cluster of blooming kalancho. Blue and white china interspersed with cookbooks and a large spray painted faux floral installation above a concrete utility sink. The front cafe area skewed a little too theme park/lodge for my tastes but I bet in the evening it doesn’t feel quite so kitchy. I like the blade sign here against the dark shed with of course tall tropical plants surrounding it. What stores do you think really nail what they do across the board? Now that I’ve shared other inspiring painting spaces are you all ready to see where Sarah Jane Tart, the artist & instructor of the upcoming Floral Painting Class at Gather on Saturday March 16th creates her work? Recently, I visited Sarah Jane at her home studio in Durham to take photos of her and her space and learn more about her. I just loved the area she has dedicated to her craft and that it is set up for her to be reminded to create something every day because of it’s location adjacent to her living room. Sarah Jane works full-time as a graphic designer and her husband is a nurse. They share their home with their adorable golden retriever puppy. How gorgeous is this wooden easel? Sarah Jane said her husband bought it for her and it made her feel like an “official” painter. Her workspace is setup off of her living room and kitchen in a little alcove with great light that used to be the dining room. In addition to the easel positioned in front of a big window, Sarah Jane has a desk area that she has set up against the far wall that she shares with her husband. Here she keeps her planners, printer, fresh cut flowers (she recently splurged on a flower subscription service) and other inspiring art by other artists. The painting you see here is the first she ever created in her floral series and was inspired by her wedding bouquet, though she’s been painting all her life and flowers have long been an inspiration for her. I’m excited for Sarah Jane to teach us her process at the upcoming Painting Florals class at Gather on Saturday March 16th where you will walk away with your own finished piece inspired by a floral arrangement still life. Will I see you there? You can register here. All photos taken by me, Michelle Smith for Gather Goods Co.